Degrees of Separation proves that opposites can attract, especially when they are being carried by a divine storyline. Some video games are very reliant on great story-telling. Not all follow this trend, however, and Mario is a great example of a game that has great gameplay but little in the way of meaningful story, however, Degrees of Separation (DofS) is not like that. This platform adventure is a unique attempt at making a video game read like a book, which is great except for the fact that it's still a game and mechanics and gameplay are key. 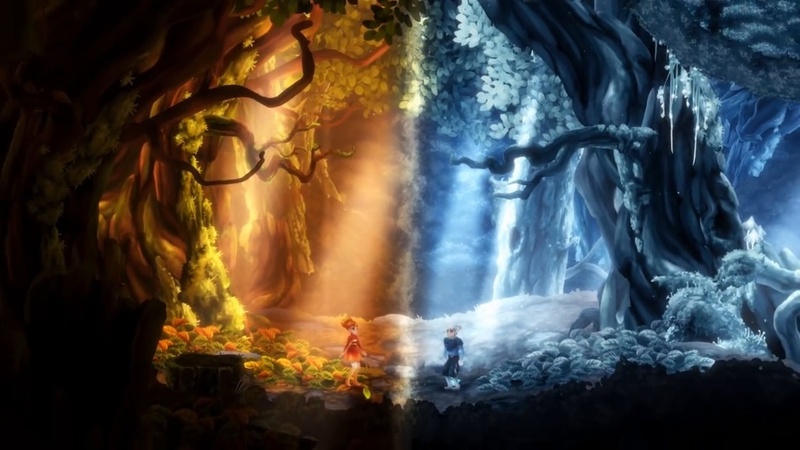 Degrees of Separation is a 2D adventure created by Moondrop that follows two protagonists who are trapped in a very different but familiar world. Ember, whom you are introduced to first, is a female character who lives in a great forest that is always in season. This gives her an association with summer and likewise a direct link to the element of fire. Her counterpart, Rime, is a male character who lives in a lonely castle in a frozen land. He has influence over winter and the element of ice. The story follows these two juxtaposed characters who have been pulled together but who are never close enough to be within reach of each other, as they work to discover the reason behind their introduction. 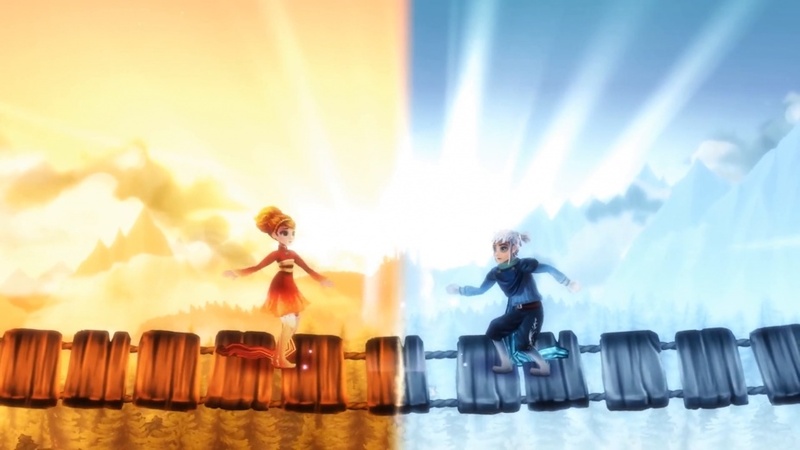 DofS challenges the player to utilise each character's abilities and links to their respective seasons/elements in order to traverse each level and beat the many puzzles found throughout the game. Starting off, it's worth clarifying what we meant when we described it as having a unique and brilliant storyline. DofS reads and sometimes plays as if it was meant to be a book. Most likely because the story was created by renowned video game writer Chris Avellone (Fallout New Vegas, Neverwinter 2 and Knights of the Old Republic). It has two well-developed story arcs that perfectly intertwine as it follows each of the main characters. Likewise, the way the story is presented to the player is similar to an audiobook, and it's so brilliantly narrated that we were getting ever drowsier throughout our playthrough. Whether this is a good feeling to experience whilst playing a video game is debatable but it sure was relaxing. Now, it is worth saying again that DofS is an incredibly beautiful game, and the art style and design is different from anything we've experienced before. Due to the nature of how the game works, each level has essentially got two skins that it switches between. What this means is that separating Ember and Rime is a border that will shift as the characters move. This means that in Ember's portion of the world, everything is summery and warm, whereas Rime's world is cold and icy. Mechanics within the world are also impacted by these changes, for example, in Ember's world water is a liquid and she will sink in it, Rime, on the other hand, will freeze the water and walk over it. So, you can probably start to see how some of the many puzzles are beginning to develop throughout the game. The puzzles themselves are challenging but usually enjoyable, very similar to those of a Zelda game where most of the time everything is okay but then you hit that one puzzle which makes you want to bash your head against a wall. The problems start arising when you sink more time into the game and the little things become more prevalent and frustrating. Most notable was the system that moves the unused character whilst you are progressing through the game. When you tell the character to follow, it will literally replicate your movement but about a second later, sort of like playing a game with high latency. This becomes incredibly annoying when they get stuck because they won't figure out how to free themselves, you have to go back and do it yourself. The movement system makes some parts of the game exhausting. Another example of this is when jumping up a ridge, as Ember and Rime will perform a vaulting action that should be seamless and last around one second, like that in most other platformers. However, in DofS, the vaulting action lasts three times as long and requires the player to control every aspect of the movement which is ironic considering there are only six controls (one of which is a pause button and another being the analogue stick) in the entire game. Moondrop could have been more adventurous with its button mapping. On the other hand, maybe this would have benefited from being a handheld/mobile release. Degrees of Separation performs well as a unique and interesting story-based adventure. However, the clunky game mechanics break the immersion frequently and cause an otherwise compelling story to be undermined. Other than some mechanical flaws, the game is largely well made and supported by clean and alluring art styles, which will surely distract any player in search of adventure. Fantastic story with great art direction, relaxing experience. Clunky mechanics and annoying movement system, frustrating moments can undermine the story.